Holiday House Guest (330/365 year 3) – Annoyingly Boring? Meet Lyle. Lyle was a gift from my daughter’s third grade teacher. He started out at 7.5 inches long. After soaking in water he quickly out grew the first two tubs we had him in. 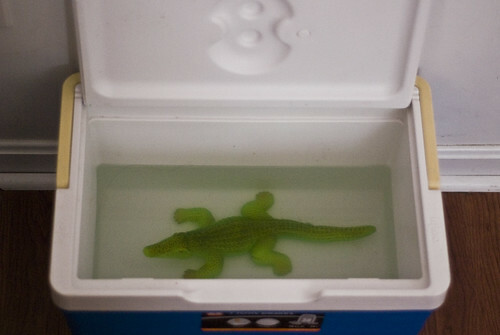 Looking for something that he could reach his full potential in I decided this cooler might do the trick. It did. Lyle maxed out at about 15 inches. My daughter and I made a growth chart, measuring his progress each day. She brought it in when school resumed and it wound up getting her 10 points extra credit on either science or math. She chose math as she was hoping to bump her math grade up a notch this semester. She now wants to measure his shrinkage if we take him out of the water to see how long it will take him to return to his original size. I love this. I never knew those things could grow that big. How fun.